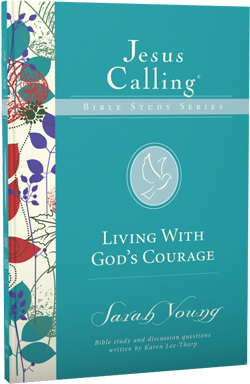 In Living with God’s Courage, the sixth study in the Jesus Calling® Bible Study Series, you will discover how God calls each of His children to not only resist fear but also move through life with courage. God’s Word reveals that the Lord is always with you and always willing to empower you with strength from the Holy Spirit. When you walk in God’s ways and recognize that He is on your side, it gives the confidence to proclaim to the world, “The Lord is my helper, I will not be afraid. What can mere mortals do to me?” (Hebrews 13:6).